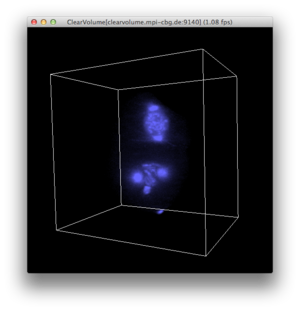 ClearVolume is a real-time live 3D visualization library designed for high-end volumetric microscopes such as SPIM and DLSM microscopes. With ClearVolume you can see live on your screen the stacks acquired by your microscope instead of waiting for offline post-processing to give you an intuitive and comprehensive view on your data. The biologists can immediately decide whether a sample is worth imaging. ClearVolume can easily be integrated into existing Java, C/C++, Python, or LabVIEW based microscope software. It has a dedicated interface to MicroManager/OpenSpim/OpenSpin control software. ClearVolume supports multi-channels, live 3D data streaming from remote mircroscopes, and uses a multi-pass Fibonacci rendering algorithm that can handle large volumes. Moreover, ClearVolume is integrated into the [Fiji/ImageJ2](Installing Fiji Plugin) and [KNIME](Installing KNIME Plugin) ecosystems - you can now open your stacks with ClearVolume from within these popular frameworks for offline viewing. A graphics card with at the very minimum 500M of GPU RAM, preferably >=1G. On windows you need VisualStudio installed (get it here) to be able to use the CUDA backend and to build ClearVolume. If you use an 'express' version of VisualStudio, you need to copy and rename the file 'vcvarsx86_amd64.bat' located in folder 'Microsoft Visual Studio 12.0\VC\bin\x86_amd64' to 'vcvars64.bat' that should be placed at the root of the VisualStudio folder e.g. 'C:\Program Files (x86)\Microsoft Visual Studio 12.0'. run gradle test an check for messages that suggest that that file could not be found. Java 8 installed. Please note that older version of java installed are known to cause problems. If you face difficulties starting the client try to remove older version of Java. A recent version of Linux, tested: Ubuntu 14+ , Xubuntu 14+. Follow instructions here for installing CUDA. Note: we have currently difficulties with a weird bug on Linux, ClearVolume works from Eclipse but not from the command line. OpenCL 1.2 capable graphics card with preferably at least 1G of GPU RAM. or go to the download page and download the whole repository. This download will only provide you with the source code. To obtain usable binaries, you need to follow the instructions below or have a look at the other downloads provided (for C/C++ and LabVIEW users). which you can use for a quick demonstration. You can adjust min, max, and gamma values with the Keyboard/Mouse shortcuts if necessary). You can also press the key 'C' while the rendering window has focus which will bring up a control window (which can be closed by pressing 'C' again). 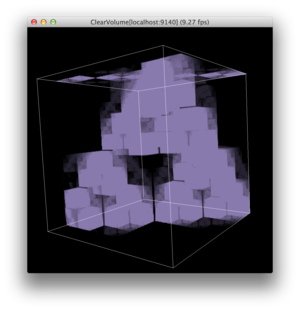 You should see a volume rendering of a 3D Volume stream of changing 3D data (adjust the gamma value with the Keyboard shortcuts if necessary). You need to provide a network address, decide on a window size. Importantly you need to specify the type of data: typically 16 bit and 1 color. If you provide the wrong information the client will return an error. We will try to improve this in a future version. If you want to use the time-shift and channel filter features just tick the mark. Note: remote time-shift only works with stacks received by the client. 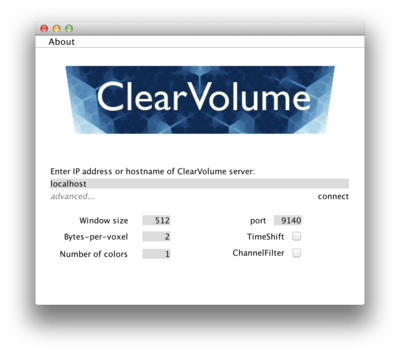 How do I integrate ClearVolume into my control software? One of ClearVolume key feature is to make it easy and painless to integrate into different systems. For this purpose we have made sure that both the APIs are simple and elegant as well as to provide bindings for all languages that we know are used for microscope control, and in particular light-sheet microscopes. In-Process: ClearVolume lives in the same process and thus data can be transferred at maximal speed. It is possible to have both: in-process with ClearVolume server listening for incoming connections, this mode offers the possibility to monitor long-term time-lapses remotely. OpenSPIM has democratised light-sheet microscopy and has made it possible for many labs around the world to build high-quality and cheap light-sheet microscopes. To support this effort we integrated ClearVolume into the OpenSPIM plugin for μManager. Go to this page OpenSPIM Manual for details on how you can use ClearVolume with OpenSPIM. If you are interested in how this integration was done, have a look at Integration in OpenSPIM.